In 1838, Jean Bardou was inspired to make a booklet of rolling papers made of pure, thin rice paper. The craftsman from France came up with a million dollar idea; the papers were a success, and the initials JB were known throughout the towns. On the papers, the J and the B were seperated by a diamond, so consumers began calling the brand JOB. The brand name followed shortly after, and by 1849, Jean Bardou filed for a patent for "Papier JOB". In the 1890's, many reknowned artists were brought in to design advertising posters for the brand. The brand can be seen all over the world, even starring in early films! Try a classic and see what the hype is all about. Copyright Cheap Cigars 4 Me. All Rights Reserved. Cheap Cigars 4 Me does not sell Cigarettes or Pipe Tobacco. This website and its use is intended for people over the age of 21. 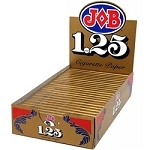 This site and its content is intended for people over the legal smoking age. By Purchasing from our site you are agreeing to an Age Verification. Prices Subject to change without notice. We reserve the right to limit quantities. Customers are responsible for their State and or Local Taxes. Prices are subject to change without notice. This website and its use is intended for people over the age. We sell Little Cigars, Filtered Cigars, Premium Cigars, Ashtrays, Lighters, Cigar Humidors.